Our first days on the road were spent in The Salton Sea area in southern California, located in the Imperial Valley, and including at the Salton Sea State Recreational Area (where we camped), as well as the Sonny Bono Salton Sea National Wildlife Refuge, both a critical part of the Pacific Flyway for migrating birds. This area is the perfect stop for almost any adventurer. It has a little bit of everything, including an interesting natural and sociological history. The Salton Sea is the largest lake in California — 35 miles long, 15 miles wide, and 235 feet below sea level. And while it sits in the Salton Sink, partly where the ancient Lake Cahuilla once existed, this current incarnation was formed by man and nature. The man part was a series of irrigation canals along the Colorado River; the nature part was a series of winter storms in 1905 that overtook the canals and flooded the low lands, resulting in the Salton Sea. 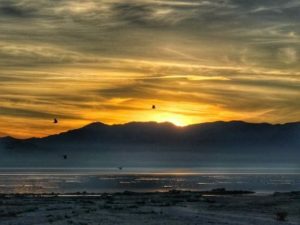 The Sonny Bono Salton Sea National Wildlife Refuge was established as a sanctuary and breeding ground for birds and wild animals in 1930, and consists of two units separated by about 18 miles of private land. 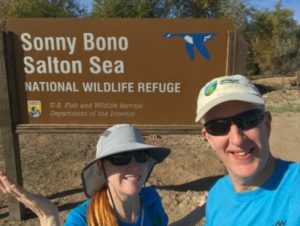 In 1998, the refuge was renamed after Congressman Sonny Bono, who played an active role in trying to save the Salton Sea. 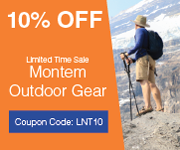 Check out the two hiking trails, one at the southern most tip of the sea, and the other along the southeastern shores. Both provide excellent opportunities to see some of the 400 species of birds and other animals cataloged in the refuge. 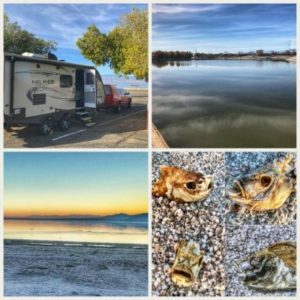 Finally, whether you stay at the Salton Sea State Recreation Area or not, do consider taking the 1-mile (loop) Ironwood Nature Trail, which can be found at the Mecca Beach Campground. The paved trail provides lots of interesting information, and a walk near sunset can provide you with a picture such as the one seen here. 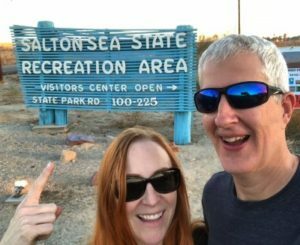 One final bonus for train lovers… the Southern Pacific Railroad runs right along the east side of the Salton Sea State Recreation Area, with more than 50 trains daily. 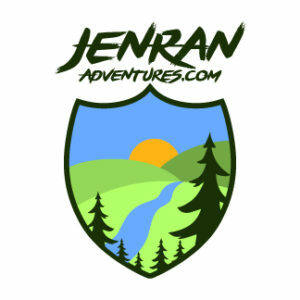 Looking for more nearby adventure? 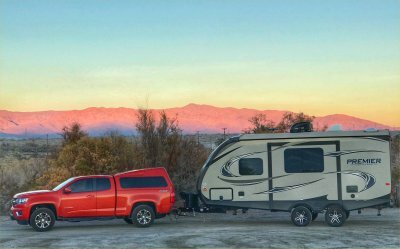 Consider a stop in the Anza-Borrego Desert State Park (to the west) or Joshua Tree National Park (to the north), both wonderful for spring desert wildflower blooms, and more.